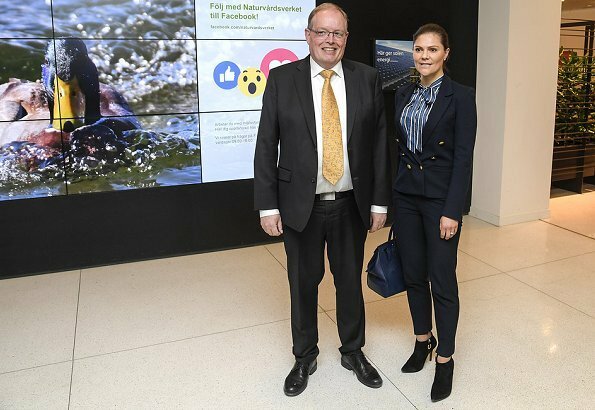 After her visit to the Headquarters of the Swedish Armed Forces, Crown Princess Victoria of Sweden visited the Swedish Environmental Protection Agency and were welcomed by the Director General of the Naturvårdsverket, Björn Risinger on April 9, 2018. Swedish Environmental Protection Agency is the public body responsible for environmental problems in Sweden. 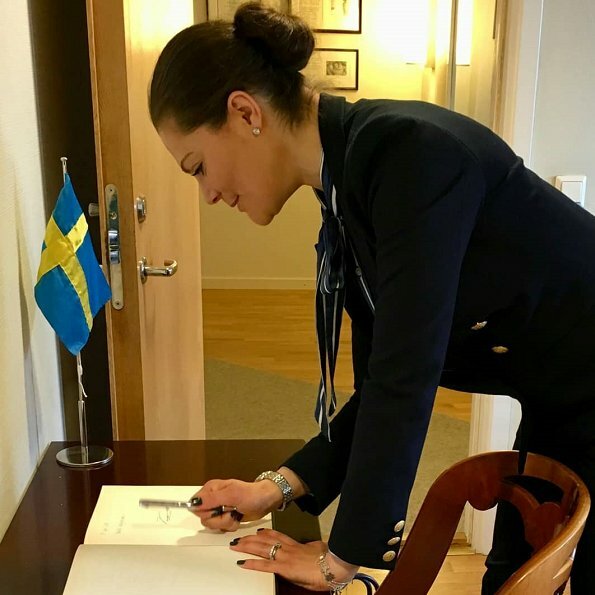 On behalf of the Swedish Government, the Agency ensures the coordination with Swedish, EU and international environmental organizations and performs the duties of protection of natural environments, cleaning and improvement of polluted areas and protection of wildlife. 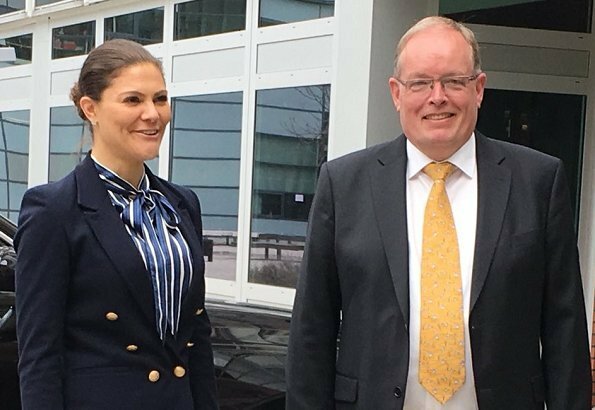 This morning, on April 9, 2018, Crown Princess Victoria of Sweden visited General Micael Bydén, the Supreme Commander of the Swedish Armed Forces at Headquarters of the Swedish Armed Forces. I give up. That looks so cheap, like a typical fashion victim going after every trend. A maritime blazer, with a matronly 70s retro bow blouse, a severe librarian hairstyle, cropped trousers and hot ankle boots, revealing an unflattering gap between trousers and shoes? Combining light blue, dark blue and black? If it at least fitted well, but that jacket is so poorly constructed, it looks terrible. It is just sad to see what nonsense high fashion houses get away with, and that high profile public figures so easily fall victim for them. The that stuff, all picked by a "stylist" and rather costly, and the result is so ... horrid. I give up. I just give up. Vanessa S, you are correct - it's a complete mishmash and not at all flattering. I loathe those bow blouses (some "styles" should never have been resurrected) and in photo # 3 it even seems she cannot stand properly in those boots. I have no words for that jacket. I give Up, too. This is the most ill fitting blazer I ever saw. Well but in her case...H&M is that cheap! The jacket is off the rack and it surprises me that she did not have it lined or pressed for a professional fit. I do love the boots and the fit of the pants. Ope, I sat on this comment and saw Ms. Electra's update. This blazer is not for the well-endowed! Vanessa S, agree with you completely! I like Victoria but this is one of the worst outfits I have ever seen. Just unacceptable on so many levels! I'm so tired of her boring style that I hardly ever bother to comment her. Hard to believe she's got a stylist! Perhaps her stylist secretly hates her? Je portais le même chemisier en 1976 et je me coifferai comme ça dans 20 ans ,peut-être. I like the booties and the pants. The blouse is quite OK, but the blazer is not mine, although I like blazer inspired by the Navy. But this one has a weird cut. I also like the boots and the pants - but I really don't understand that blazer. I first thought she did not close the buttons. Strange! anyone get that kind of information in such an ideal mannner of writing? oon the search for such information. Strange blazer. It seems to have shrunk. And the gap between the pants and the boots is horrible. The jacket does not fit her at all. Its super ugly. The bag is not a Longchamp, it is her Ralph Lauren Bag. I am so tired about those blouses and blazers. And again dark blue with black. It is boring. I hope she will get more colourful clothes in spring- and summertime. 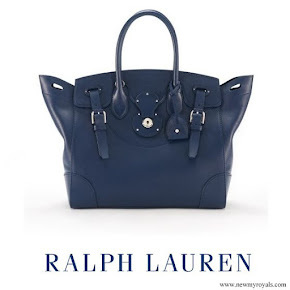 I love the Longchamp purse! It’s a tote but not a gigantic one. Oops! The picture of the bag was changed! The whole mishmash is awful, and I believe she will never, ever, change her hair. Nobody looks good with the hair pulled back so severely from the face. What in the world was she thinking? The whole mishmash is not only mismatched but doesn't even fit. And even a very beautiful woman looks terrible with hair so severely pulled back from her face. She can not dress and her hair is booooring. Rich, beautiful and famous... it could be sooo much better. I do not understand the fuzz about the gap between the pants and the boots. It looks fine to me. That's what you get with cropped trousers. Can somebody explain to me why that gap is horrible? Cropped trousers will naturally leave the ankles exposed, but the problem here is not the exposed ankles as such (which would be somewhat fine with casual summery flats or - better yet - barefooted), but the combination with the ankle boots is really what makes it all so terrible. Ankle boots can really only be worn with long (full length) trousers, covering the upper part of the shoe. In my world, cropped trousers worn with heels are always bad. Worse still though is cropped trousers + ankle boots (along with skirt + ankle boots). Well, people are sometimes a little bit narrow minded, when it comes to fashion. I don't mind the little gap at all. For me cropped trousers are a chance to see the ankle boots better. Short skirts and ankle boots are ok, if the legs are ok. Long skirts are ok with flat ankle boots (Western Style) but not with heels. Well, that is my opinion. Slim cropped pants with ballerinas are the best style - so audrey. And women gave her a very hart time for it. Ballet shoes & pants, a no go in the 1950 for a grown up. That is the hight of fashion sense, to wear what you want and not what others want you to wear. But the blazer is still horrible - so sorry! 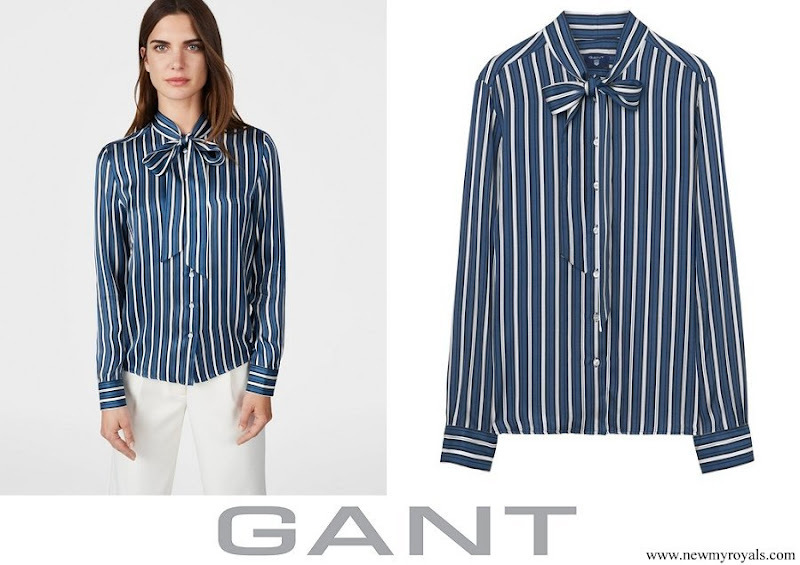 I like the jacket on the model and matched with the blouse it's not optimal but not completely wrong. But together with these trousers the proportions don't fit. Personally I like cropped trousers with ankle boots but then the top has to be loose fit. She is so cute! I do like it when she wears more tailored outfits, but this just doesn't seem to fit right.